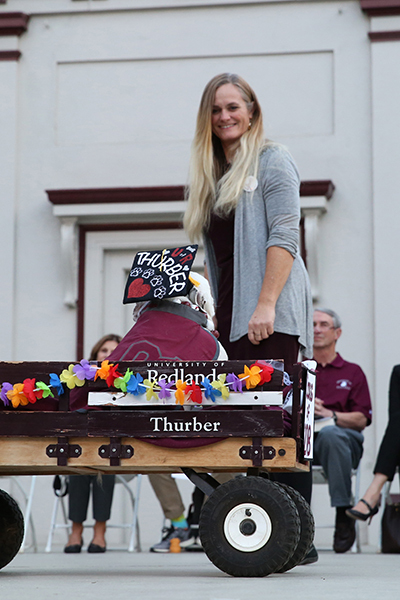 Surrounded by 200 of his closest friends and admirers, Thurber graduated from the University of Redlands on Monday. He was awarded two bachelor’s degrees in math and psychology, with minors in theatre arts and human-animal studies. Thurber passed away the next day, due to complications from an aggressive cancer. Ben Galgano ’18 explained that when students in the class of 2018 found out that Thurber likely wouldn’t be able to graduate with them as originally planned, they sprang into action, organizing, in a matter of days, a special graduation event for Thurber in the Greek Theatre. “We are proud of you and your affiliation with the University of Redlands,” added President Ralph Kuncl, whom Thurber then bestowed with his signature high-five. Watch a video from the ceremony. 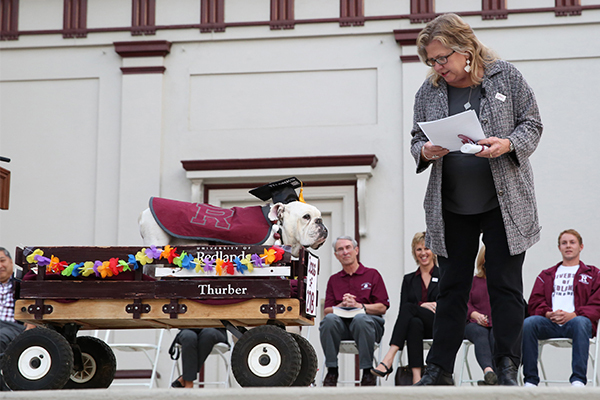 Doolittle noted the University’s mascot-in-training, Addie, will begin to assume as many of Thurber’s mascot duties as her age will allow and will be officially installed as mascot at a home basketball game in January. 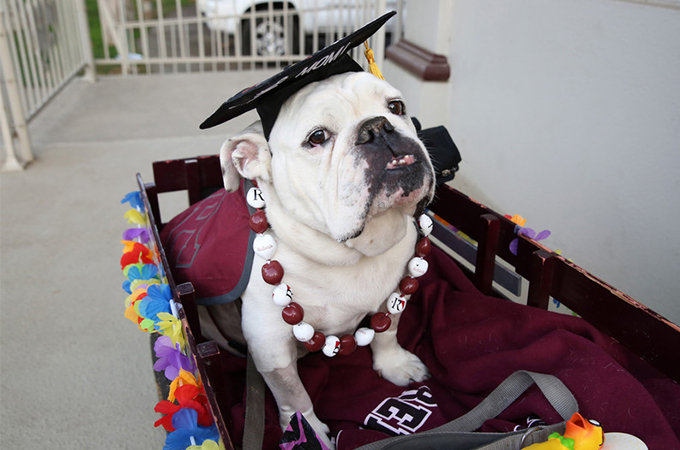 We will miss Thurber deeply, but I know we’re all glad we got to dedicate one last special day to the beloved mascot. Click through the gallery below for photos of our good boy through the years. Note: This blog, originally published November 14, was updated on November 15, 2017.